A workflow defines the possibility to go from one status to another one, and who (depending on profile) can do this operation for each status. Once defined, a workflow can be linked to any type of any item. Id Unique Id for the workflow. Name Name of the workflow. Sort order Number to define the order of display in lists. Closed Flag to indicate that workflow is archived. Description Complete description of the workflow. This button can be used to hide some unnecessary status. The workflow diagram presents a visual representation of the workflow displaying all possible transitions (independently to profile rights). The habilitation table helps defining who can move from one status to another one. Each line corresponds to the status from which you want to be able to move. Each column corresponds to the status to which you want to be able to go. It is not possible to go from one status to itself (these cells are blank). Just check the profile (or “all”) who is allowed to pass from one status to the other. Anyone can move an item from “recorded” to “assigned” and from “recorded” to “cancelled”. No one can move an item from “qualified” status to any other status. In this case, pay attention that it must never be possible to move an item to “qualified” status, because it will not be possible to leave this status. The application is able to automatically send mails on updating event. Events are defined on an element and element type. The mail message is formatted to display item information. Mail titles is defined in Global parameters screen. Id Unique Id for the event. Element updated Type of elements that will be concerned by automatic emailing. Type Type of the selected element updated. New status Positioning the elements to this status will generate an email. Or other event Other event that will possibly generate an email. Closed Flag to indicate that status mail is archived. If not set, the event is valid for every type of the element. List of addresses of the mails. The list is not nominative, but defined as roles on the element. Each addressee will receive mail only once, even if a person has several “checked” roles on the element. See: Receivers list for receivers detail. It is possible to define a default delay for tickets, for each ticket type and each ticket urgency. On creation, the due date will automatically be calculated as creation date + delay. Id Unique Id for the delay definition. Ticket type Ticket type the delay applies to. Urgency Urgency of ticket the delay applied to. Closed Flag to indicate that delay definition is archived. Days : simple calculation as days. Hours : simple calculation as hours. Open days : calculation excluding days off (weekends and days off defined on “calendar”). Open hours : calculation only on the “standard open hours” defined in Global parameters screen. It is possible to define indicators on each type of element. Depending on type of elements the type of indicators that can be selected in list differs. Some indicators are based on delay (due date), some on work, some on cost. For each indicator a warning value and an alert value can be defined. Id Unique Id for the indicator definition. Element The elements the indicator applies to. Type Type of the elements the indicator applies to. Reminder Delay before due date or % of work or % or cost to send a warning. Alert Delay before due date or % of work or % or cost to send an alert. See : Receivers list for receivers detail. List of addresses of the internal alert. The predefined note set the possibility to define some predefined texts for notes. When some predefined notes are defined for an element and / or type a list will appear on note creation. Selecting an item in the list will automatically fill in the note text field. Id Unique Id for the predefined note. Name Name of the predefined note. Element Kind of item (Ticket, Activity, …) for which this predefined note will be proposed on note creation. Type Type of element for which this predefined note will be proposed on note creation. Text Predefined text for notes. If not set, predefined note is valid for every element type. If not set, predefined note is valid for every type of the element. 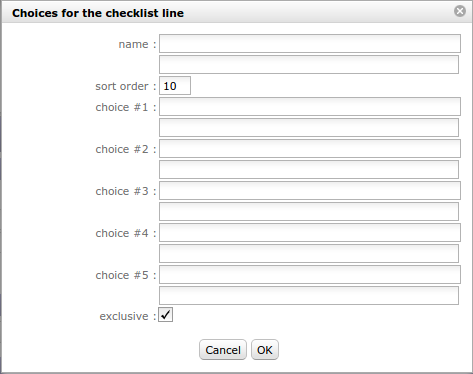 It is possible to define checklist forms for each type of element. When a checklist form exists for a given element, the checklist is available for the element. Id Unique Id for the checklist definition. Element The elements the checklist applies to. Type Type of the elements the checklist applies to. Closed Flag to indicate that checklist definition is archived. A checklist is built from checklist lines. Click on to create a new checklist line. Click on to update an existing checklist line. Click on to delete the corresponding checklist line. Name Name of the subject of the checklist line. Sort order Order of the line in the list. Choice #n Possible choices (checks) for the list (up to 5 choices). Exclusive Are the choices exclusive (select one will unselect others). Each line has a name, an order and up to 5 check choices. A line with no check choice will be displayed as a section title. Help text that will be displayed as tooltip. Checks can be exclusive (select one will unselect others) or not (multi selection is then possible). Receivers can receive email and alert. A description of receivers below. The contact defined as requestor on current item; sometimes appears as “contact” (on quotation and order, for instance) and sometimes have no meaning (for instance for milestone). The user defined as Issuer. The resource defined as responsible. All resources allocated to the project. The resource(s) allocated to the project with a “Project Leader” profile. The resource defined as the manager on a project. Provides an extra field to manually enter email addresses. If “other” is checked, an input box is displayed to enter a static mail address list. Several addresses can be entered, separated by semicolon. A performance indicator or key performance indicator (KPI) is a type of performance measurement. It is possible to define Kpi on incomings and deliverables items. Name Name of the KPI. Code code of the KPI. Description Complete description of the KPI. Idle Statut of the KPI. Description integrates the formula used to calculate the KPI. It is possible to attributes tresholds lines to KPI. Click on to create a new JobList line. Click on to update an existing JobList line. Click on to delete the corresponding JobList line. Keep in mind KPI is an indicator of performance at project level (opposite to indicator which is calculated at item level). Management of the JobList can be used for each element but it usually used to detail an Activity or Ticket. It is an indicator to follow the respect of dates values. Id Unique Id for the KPI..
IdChecklistable Unique Id for the Checklistable. idType Type of the elements the joblist applies to. A JobList is built from JobList lines. Looking like CheckLists with no choice.